Hate the way Tokeet shows dates in the date selection fields? Well, stress no more. Now you can change the format of your dates by adjusting your preferences in your Account settings. We spend a good bit of time and resources supporting our users. Although we enjoy the interactions, ultimately we hope that you wouldn't need to contact support at all. The only way this is going to happen is if we make Tokeet incredibly easy to setup and use. 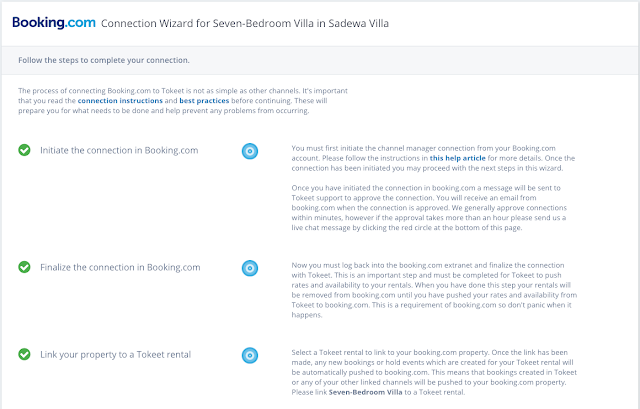 Today we released our Booking.com setup wizard. 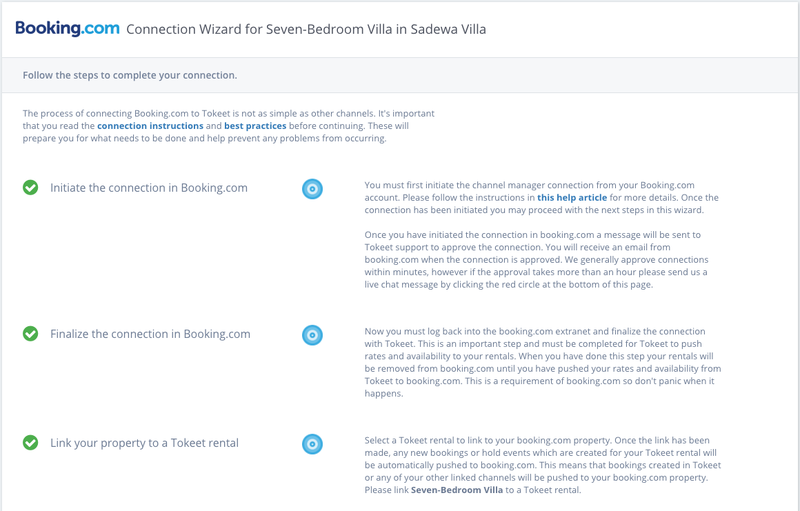 The goal of the wizard is to walk you through the setup and configuration of your booking.com connections. It answers all the questions that we are normally asked in support and tries to prevent costly and frustrating misconfigurations from occurring in the first place. The wizard is automatically engaged if Tokeet detects that your booking.com connection is potentially not complete. 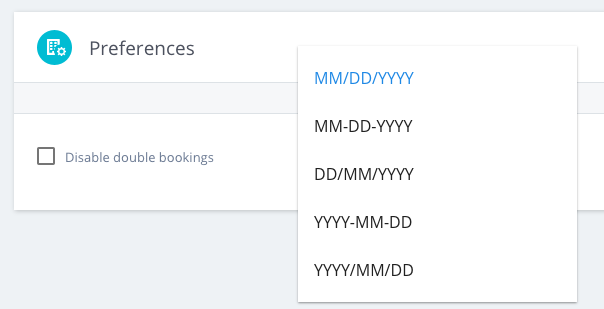 Simply click on any of your booking.com connections. If the connection is complete, then you will see the normal connection details page. Otherwise you'll be taken to the connection wizard. Two years ago I purchased my second vacation rental home, and just like you, I needed a system to help me manage it. I began researching all of the popular solutions and was surprised at how expensive and unusable many of them were. As a developer I knew that a better solution was possible. So after much deliberation I decided to leave my existing job, build a team, and start Tokeet with my own money. On January 1st, 2016 Tokeet came out of Beta and we began advertising to the public. At the time we had a basic reservation manager and allowed only iCal synchronization. It was a simple product which some found useful, but many of you wanted more. We’ve worked tirelessly over the past 16 months to grow the product from these simple beginnings into an extensive platform filled with many of the features you need. It’s been a crazy period and we’ve moved fast, breaking a few (many) things along the way. We implemented your feedback quickly, often times the same day, and listened intently to everything you had to say. Our staff is filled with mostly engineers, even our support staff, and we simply love building things. We provided real-time customer support for every user, even the free accounts, and now have 24/7 real-time support with team members in 5 countries. Tokeet has become popular in a big way. We’ve been growing rapidly, bursting at the seams, and simply cannot keep up without further significant investments. We’ve considered outside investors-- most of our competitors have already gone down this path, but every investor wants to change the way we work. Either by drastically increasing our price to match our competition, limiting our support and features, or focusing the company on larger customers. These are all contrary to what we believe and stand for as a company. Tokeet must remain a PMS for the masses and we don’t plan to compromise on customer support. So now we’re forced to change the one thing which we’ve never changed: our price. We’ve kept the same pricing from the start, even after adding 4 new products to the platform. In most cases, Tokeet is 10% - 25% the price of our closest competitors. We plan to double our pricing on average to 20% - 50% of the competition pricing. This new pricing will take effect on May 1st and you can see it on our new pricing page. This price change will allow us to continue in our current direction and expand our products and features. If you think we’re great now, wait till you see what we have for you in 2017. We plan to completely change this industry forever. For those of you who have been with us from the beginning, you’ve seen us grow and helped us get better. All of you have been a part of our journey, and we’re immensely grateful to have you as our customers. We would like to reward your loyalty by offering you the chance to keep your existing pricing for the next year or two, no matter what else changes. Customers who subscribe before May 1st may keep their current plan for the next 1-2 years by purchasing special one or two year plans which are billed one-time and upfront. These special yearly plans are not available online, so email us directly to inform us of your interest. Simply reply to this email. If we don't hear from you then you will automatically be switched to the new pricing after May 1st. I personally thank you for being a part of the Tokeet journey and I am excited for our future. If you have any questions please ask our support team. Our best is still ahead of us.